Founder of Canine Clippers, Inc.
Linda Law is a Certified Master Groomer with the National Dog Groomers Association of America and International Professional Groomers, Inc. Her family members have been professionals in the fields of pet care, training, and grooming for three generations. Ms. Law founded Canine Clippers School of Pet Grooming in 1982 and the Virginia Groomers Association in 1987. In 1993, Virginia Women in Business of Northern Virginia nominated Ms. Law ‘Enterprise Woman of the Year’. She has shown in national dog grooming competitions and has been invited to judge and speak, not only at the American Kennel Association, but other national grooming competitions as well. Along with owning and managing a school for pet grooming incorporated in three pet grooming salons located in Northern and Central Virginia, Ms. Law gives private grooming lessons, teaches and counsels not only students, but professional groomers interested in starting their own practices which include Mobile Pet Grooming businesses. She also raises Toy Poodles and Arabian horses on her farm in Central Virginia. Mari Dancause, NCMG, Certified Master Groomer, is the manager of our Chantilly salon. She is a graduate of Canine Clippers School of Pet Grooming, and has been with our company since 1994, when she started as a bather. Since then, she has gone on to become an award winning groomer. Mari has placed in many competitions. Some of her awards include: 1st place in ‘Creative Styling’ at the 1999 VGA Show, Leesburg; and, in 2004, a 1st in ’Mixed’, a 1st in ‘Feline Fantasy’ at Intergroom, N.J., and a 1st in ‘Creative Styling’ at Groom Expo, Hershey, PA. Currently she is the at our Chantilly location of Featherle Pet Care. Highest on Mari’s list of priorities are the health and safety of the pets at the salon and the happiness of the staff. She recognizes the inherent personality, intelligence and feelings in animals and feels a strong aversion to their treatment as possessions. Developing a good rapport with dogs that even a vet cannot handle is only one of her many special talents. Mari is quite eclectic in her skills and grooms all breeds, including the unusual. Her artistry comes naturally: her grandfather was an oil painter and her own talents include drawing. But, her most original work now takes place in the grooming salon where she loves the challenge of ‘Custom Orders’: Non standard cuts and styling. Mari shares her home with two felines: Mac and Miskie. Jenny Wilkerson, NCMC, is one of the skilled nationally certified master groomers we, at Featherle Pet Care Chantilly, are lucky enough to work with. The grooming bug bit her later on when she got her first Cocker Spaniel. She groomed him his whole life and proceeded to create a life skill from that experience. Her gentle but firm hands are incredible in teaching even the shyest of dogs to appreciate the grooming experience. Jenny is highly motivated with a unique ability to read a pet’s body language to determine how it should be handled. Knowing these things makes her more than a stylist. She’s a member of a team dedicated to a pet’s overall care and health. She finds each pet has its own individual and unique history to tell, and she is there to listen. She does not have a single favorite breed, though her grooming expertise is with two high maintenance breeds, Bichon Frise and Cocker Spaniel, she enjoys working with all dogs. Sharing her home are four furry friends: Calli and Emily, Parti Cockerspaniels, and Prince, a Chihuahua, and Rusty, a miniature poodle. Carissa Feaganes is our newest addition to our grooming family. She began with us as a part-time bather during her high school years where her budding interest for grooming began. 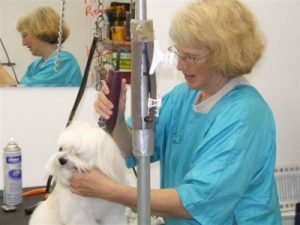 After high school graduation she began her journey to become a groomer by attending our school at our Culpeper location. She proved to be a natural and was an outstanding student. Carissa has aspirations to continue her education and work hard to become a certified master groomer. Working with puppies and teaching them grooming is a fun favorite for her. Carissa lives in the country with her parents and her dogs (Ammo, a Blue Heeler, and Bella, a Yorkie). Sarah Jenkins returned to us after graduating from Canine Clippers School of Pet Grooming six years ago. We are happy for her return. Being a hard worker Sarah is always ready to lend a hand. She has a soft spot for poodles and delivers a beautiful show worthy poodle groom. Her passion for poodles allows her to be quite skilled with grooming the ever growing in popularity poodle mixes. Sarah aspires to become a certified master groomer, is hoping to join the competition groom circuit and begin competing in the next few years. Sarah lives in Fredericksburg with her Fiancé, son, and step-son. They share their home with Harley a Pitbull mix and Pixie a DSH feline. Miranda started our school in December of 2017 and this is when she fell in love with grooming. We were very excited when Miranda chose to join our grooming family. Having previously worked at a veterinarian clinic she comes with a medical background and CPR training that are both assets to the grooming field. A special place in her heart is for our older furry clients and two of her favorite breeds are Bichons and Corgis. An artist at heart she is very creative with her styles. Miranda can be found mainly at our Wash-N-Wag of Culpeper location and at occasionally our Featherle Petcare of Chantilly location. Taylor, our receptionist, joined our family in June of 2018 and has quickly become an asset to the salon. Being well organized she is able to keep all records up to date to ensure appointments run smoothly. Along with her organizational skills keeping the schedule running smoothly, she is also a trained bather. Her love and respect for animals started at a young age and has only grown as she has. Her patience and gentle nature allow her to be a natural caregiver increasing her ability to ease anxious dogs. Her experience with many different breeds over the years has given her the ability to assess the situation to cater to each individual dog that comes to our salon. Taylor lives in Culpeper with her fur babies Rocky (a Pitbull) and Adrian (a German Shepherd Mix).